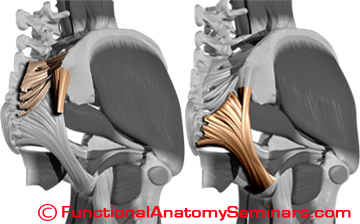 Dr. Spina discusses the functional anatomy and clinical importance of the Dorsal Sacral-Sacrotuberous ligament complex including postural considerations. He also discusses the important distinction between the Long (or superficial) and Short (deep) Dorsal Sacral Ligaments. In addition, Dr. Mike Chiver’s is shown introducing some Functional Range Release™ technique concepts to his small group after the central demo. These clips were taken at a Functional Anatomic Palpation Systems™ ‘Lower Limb’ seminar in Toronto, Ontario, Canada.